As the third race of the year, and the last of the initial flyaway races, the race in Sakhir provides yet another challenge for the teams. Located in the desert, the hot and dusty environment is a harsh environment for a Formula One car. The track itself provides some stern challenges, with high-speed braking, long straights and clumsy slower corner sequences compromising the cars set up. Despite the 2005 cars not returning to Europe for testing there were a surprising number of developments seen in Bahrain, as well as the debut of the Ferrari F2005. Probably due to this, the team's relative competitiveness remained static, with only Michael Schumacher showing improved speed with the new car, although both Ferraris suffered from poor reliability. With the fast straights at the circuit teams were trading some downforce for greater efficiency; most teams ran without flip ups on their front wing endplates and with slightly less cooling bodywork than in Malaysia. With so many slow corners sandwiching fast straights, brake-cooling ducts were large and in the race failing brakes afflicted many drivers. Tyre wear did not seem unduly affected by the traction requirements of the fast-slow-fast complexes; apparently the engine traction control and the marginal brake cooling gave the tyres an easier time on a track without any fast corners. Ahead of its intended race debut Ferrari brought their definitive 2005 car to Bahrain; up until now the team had tested and raced the revised 2004 car. When deciding what was required from a car to suit the new rules Ferrari decided a major redesign was required in several areas, rather than a mere evolution of the current car. As a result the team completed major modifications to the F2004 in order to make it race worthy; with the plan to race it until the European season in either San Marino or Spain. Despite the F2004's advantage over its rivals in 2004, the progress made by the other teams with their new cars over the winter eclipsed the cars initial advantage despite its winter overhaul. The opening races could be considered wild cards in a 19-race season, with extremes of weather from rain to tropical heat. In Australia the F2004M acquitted itself well for Rubens Barrichello, while Schumacher's weekend was compromised by rain in qualifying and a race incident. Malaysia showed up the car's shortcomings more seriously; the car lacked downforce and wasn't working well with its tyres. With so many rivals on the currently superior Michelin tyres Ferrari are at a major disadvantage if their tyres are inferior to those of the other seven teams. Ferrari's malaise was further shown up by the rapid degradation of the rear tyres; this problem was made worse by debris robbing Barrichello of even more rear downforce. Clearly the F2004M/Bridgestone combination was not competitive enough; with another hot race in Bahrain due, the problems could only be expected to continue. So Ferrari decided to race the F2005 without the anticipated amount of testing for the new car - three to five weeks depending on when Ferrari really wanted to debut the car (Imola or Barcelona). With only two chassis in existence and a lack of spare parts the decision was a risk, but was balanced against the old cars potential lack of competitiveness. Going back to late last year Ferrari's design team reviewed the new rules and made some conclusions as to what would be required to optimise the car to the new rules; as a result regaining the lost downforce and helping long life tyres were their main targets. While front and rear wings were modified under the new rules, optimising them would be a relatively straightforward matter; recouping the losses from the diffuser were a greater concern. The diffuser now has to have lower outer channels, limited to 125mm or about half of that previously. With the larger central tunnel unaffected, clearly this was where the work was needed. The central tunnel actually starts along the step under the car; the vertical faces of the step curve in to form the upper surfaces of the tunnel, and the only limit in making the curves more aggressive and higher was the shape of the gearbox case sitting above the diffuser. On the F2004M the gearbox compromised this shaping, and large blisters were required to wrap around the underside of the gearbox (see picture). Ferrari's focus for the gearbox up to this point was to make the box lower and shorter; this resulted in the case and its hydraulic ancillaries being quite wide at its lowest point. 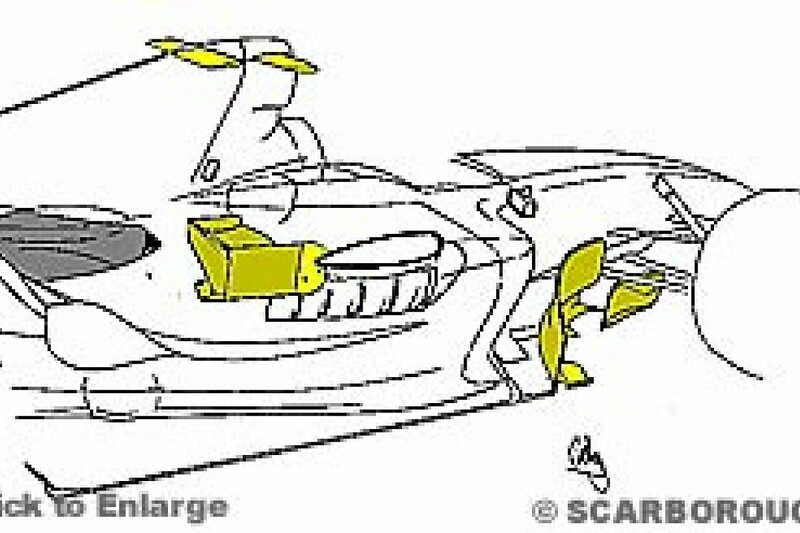 Ferrari decided the critical design change for the F2005 was to be the gearbox packaging to allow the first part of the central diffuser to be more aggressive. It was this late decision that delayed the F2005 project, as the gearbox is one of the longest lead-time parts on an F1 car. The new casing has yet to be seen in detail, but from the view of the stripped car below it is clear that the area under the gearbox is much clearer of obstructions, and the few dim views of the diffuser appear to form a sleeker transition from step to diffuser. This delay has allowed Ferrari potentially a greater amount of rear downforce, one of the problems afflicting many teams so far this year. As far as the gearbox itself, its construction is in cast titanium with carbon fibre wrapped around critical areas for strength, with seven forward ratios and the dampers/torsion bars being mounted in typical Ferrari style on top of the casing. Allied to the gearbox the suspension geometry has been revised to take more care of the tyres; Bridgestone have yet to construct their definitive 2005 tyre, with the F2004M running on development tyres and the Bahrain race using a hybrid tyre. The real 2005 tyres should be seen at Imola after extensive testing in between races. Looking around the rest of the car it initially appears unchanged from the F2004M, but it abounds in detail changes. Starting at the front, the bulbous nose cone of the interim car has gone, replaced by a sleeker shape. The front wing retains the three-element wing raced so far, complete with its chin wing. Flow from the front wing trails back around the single keel chassis and is shaped by modified bargeboards, now with a small axe-head (yellow) similar to that used by Renault on the trailing edge of the main bargeboard. This component is designed to flick up the flow going around the board and prevent it going under the floor. The sidepod fronts are subtly more undercut and the inlets are mounted higher, also being wider to retain a similar cross sectional area. The inlets feed newly laid out radiators. Following on from Renault's design last year (and this year's Sauber), the coolers are split into two and folded into a V; this allows the radiators to be large enough and still fit within the aerodynamic shape of the sidepods. Cooling outlets are revised chimneys, augmented with grilles for Bahrain. As with most teams an asymmetric chimney layout can be used; even when the chimneys are required they are in place but closed off as they act as a turning vane splitting the flow to the rear wing from that passing over the winglet. 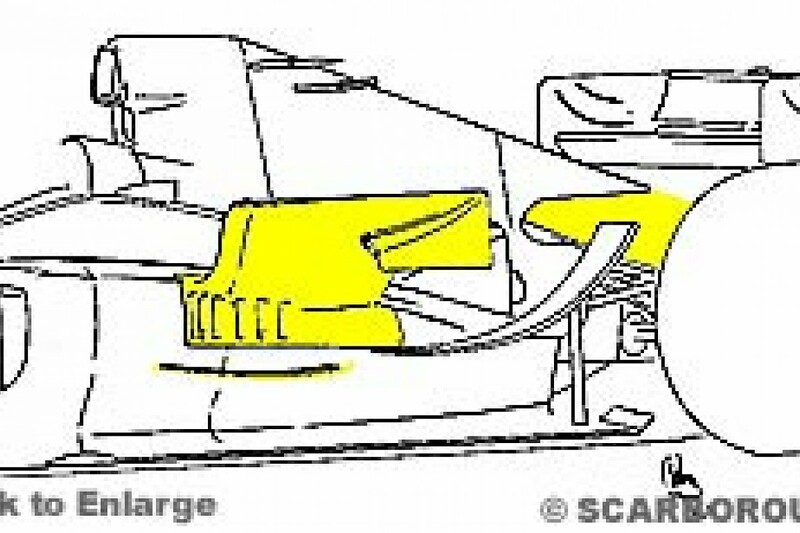 Ferrari created a slightly larger winglet with a bolted on extension to the endplate (yellow); this made the outer chord of the winglet very long and is split by the trailing edge of the chimney. The efficient shape of the chimneys allows the sidepods to be more waisted, forming an almost straight-line from their fronts to tight against the gearbox, necessitating a bulge to clear the exhaust system. 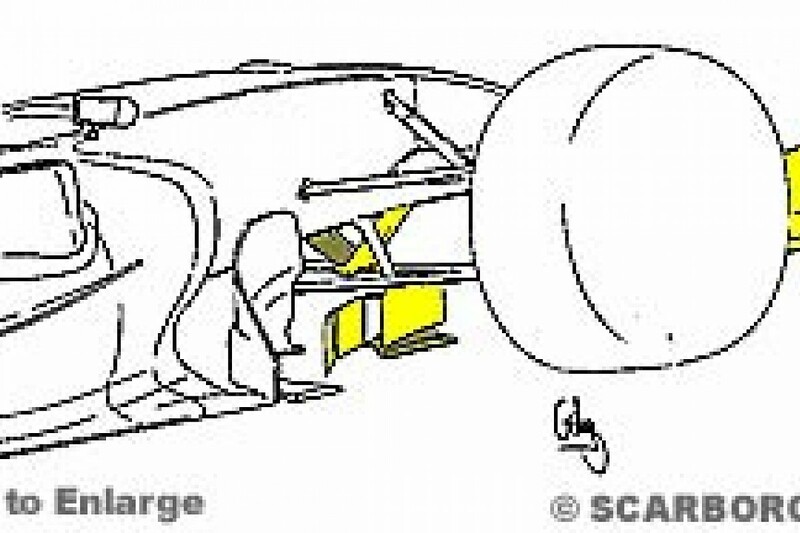 The exhaust now eschews the Ferrari lead periscope shape; instead the exhausts meet at a forward facing collector with the secondary pipe then curving back on itself to exit quite far forwards (grey). This design allows the sidepods to be slimmer as the exhaust is the limiting factor in this area; it also removes the obstruction of the exhaust ahead of the rear wing. As a result the set up should be a little more efficient than the periscope design. Also aiding the rear wing are two mid wings mounted atop the roll structure/engine cover, plus a shelf wing between the rear wheels. As mentioned previously the team have added a small winglet above the taillight to further bolster rear downforce. Mechanically the car uses a new monocoque which is lighter despite the requirement for more stringent crash tests. As with all cars the Ferrari is heavily ballasted, with the grey slabs of tungsten bolted to the bottom of the chassis, as well as that mounted to the floor itself. The 055 engine has been developed with the 053 (2004) engine as a base, the development being aimed at gaining the reliability over the extra distance required. Some of the developments were in use on the F2004M engine. Controlling the engine, gearbox and chassis is a new data acquisition system, built by Ferrari themselves. Friday started with mixed signals for the team, with Schumacher going out and setting second fastest time on his first run, while Barrichello had a catastrophic gearbox failure. It appears Barrichello's gearbox problem was caused by a bearing failure; the resulting damage left the gearbox seriously damaged. Unfortunately there was not a spare ready when the cars were shipped to Bahrain; it took until Sunday morning for Barrichello to have his new gearbox. In the meantime running repairs were made to his original gearbox, so he kept his running solely to qualifying. Up until first qualifying he had completed only 5 laps, and Schumacher had to complete the team's tyre evaluations. The other concerns were cooling on both the engine and the ECU's, having only run the car in Europe up to this point. But once the correct outlet ducts were decided, no cooling problems were found. Again Barrichello sat out the Saturday practice sessions and Schumacher limited his running to just 12 laps completed at the end of the sessions. In Q1 Barrichello's lack of familiarity cost him when he locked up going into turn one and ran wide; throughout the car appeared nervous going into corners, but he managed to qualify 15th with his old gearbox. Schumacher meanwhile had a better lap and, although he also had to nudge the car into corners, his good straight-line speed (325.5kmh) put him third, a lap which Ross Brawn later called a "conservative lap". His Q2 lap was better and allowed him to start the race in second, while Barrichello remained in 15th. At the race start Schumacher tussled with Jarno Trulli but managed to stay ahead and pressure Fernando Alonso in the opening laps; Rubens also managed to make progress in his opening stint. But on lap 12 Schumacher had a hydraulics failure, causing him to spear off the road with crippled steering and gearbox. He returned to the pits but had to retire. 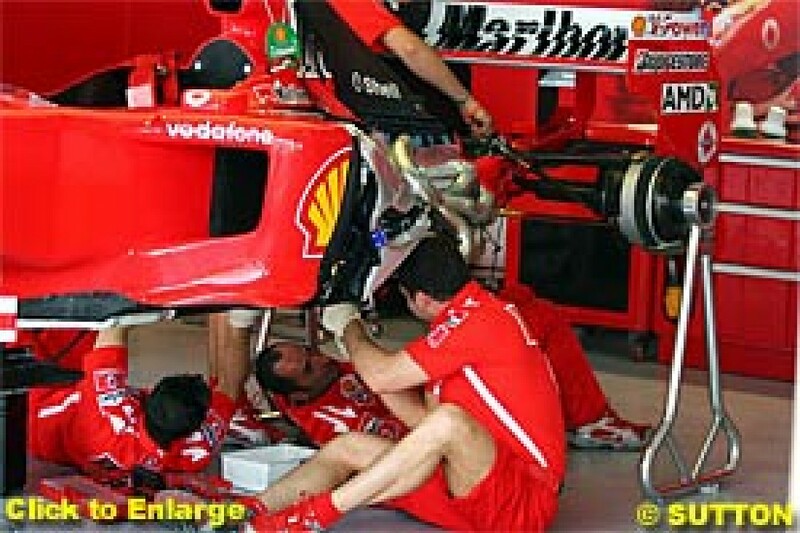 Immediately after the race Schumacher suspected a leak caused by debris holing his hydraulics cooler, but this was not the case and the real cause was the failure of the hydraulic pump, a carry-over part from the F2004. Meanwhile Barrichello started to find his rear tyres degrading, locked a brake and skewing across the road on the lap before his first pit stop. His handling continued to deteriorate with the tyres until the later laps, where he was unable to fight other cars with better traction out of the turns. He finally finished ninth but a lap behind. The team have admitted they are struggling with aerodynamics this year; the front wing is pinpointed as a problem, with new versions due for testing this week. After the dual engine failure last race the Honda engineers had a revised spec for Bahrain, with general improvements as well as a solution for the oil sensor failure which caused the retirements in Malaysia. Friday started poorly for Takuma Sato, with a gearbox problem costing him the morning session and the afternoon seeing him stranded on track after spin failed to kick in the anti-stall system. Qualifying saw the drivers go out early as a result of the opening lap engine failures in Malaysia, and the dusty track conspired to slow their otherwise error free laps with Sato ending up just behind Jenson Button in 13th. Button subsequently improved in the second session to start the race in eleventh. The race started well for the team, with the drivers seeming competitive. Soon Sato's brakes started to throw huge dust clouds in the braking areas, his pace started to diminish as his brakes overheated, and finally he had to retire with overheated and overworn brakes. Once in the pits Sato commented on a clutch problem. This problem was also starting to affect Button; at his second stop after the mechanics had checked his brake wear and refuelled him he failed to pull way, stalling the engine. Several attempts were made to restart the engine and allow Button to pull away, but when the car finally pulled away it broke down at the pit exit, forcing his retirement. Renault appeared with new bargeboards at Bahrain. The new layout alters the smaller forward-placed boards for a complex arrangement. With no less than four elements, a strut sprouting from the v keel mounts the main board with a smaller outer board sandwiched to it, then two more curved boards trail from slim mounts on the main board. As with most other teams, Renault ran simple endplates without extra flip ups on their outer edges. Not running at all on Friday morning, the drivers completed over twenty laps each in the afternoon to assess tyres on longer runs. Saturday free practice session saw slightly less running, as the team were comfortable with their pace. Giancarlo Fisichella was handicapped by his Malaysia retirement and went out early in the first qualifying session; he got out of shape in sector 1 and sector 3 due to the dusty nature of the track, but his final time for fifth was impressive considering this. Alonso went out last, utilising the best conditions and with a blinding sector 2 took provisional pole going into Sunday's session. Fernando had to push hard in Q2 to gain pole, but Fisichella's lap dropped him to tenth. The race cemented the drivers fortunes; while Alonso cruised to an easy win, Fisichella had his engine start to fail on lap 2, passing smokily through the pits only to retire next time around into his garage on lap 4. Yet more developments were seen on the car; for cooling Williams ran a Red Bull-like chimney, with a long duct exiting vertically and the winglet directly attached to the duct. As in Malaysia, the Williams added grilles to the panel and large exhaust fairings for extra cooling. BMW have admitted the car is marginal on cooling, with Mario Theissen explaining the car ran its maximum cooling arrangement and the car was still running too hot; as a result rev limits were imposed to protect the engine. This rev limit restricted the cars top speed on the straight, which was consistently 10 kph down on its rivals. At the cars launch it was a feature of the car to run the engine hotter, in order to reduce the sidepod and cooling sizes. It appears that this philosophy has its limitation at the hottest tracks; with several hot races expected later this year Williams have some more work to do on this area. Aside from cooling developments, there were also some new performance parts on the car. The sidepod flip up has been bolstered with a smaller narrow strip preceding it below the cooling chimney. The very different shape of the extra flip up to the main one suggests Williams are finding the flow around the sidepods is different to that expected. Also the engine cover has been revised with a McLaren/Ferrari-like cut away, this could improve the rear wings performance when the car is yawing (sliding). Very little running was completed on Friday morning, with a greater track time in the afternoon. A similar pattern emerged on Saturday; only Mark Webber topped the time sheets in the session before Qualifying 1. His ultimate pace was eclipsed in Q1 but a tidy and fast lap brought him provisional sixth place, while Nick Heidfeld had a slower sector 1 but regained the losses with a much faster third sector to beat Webber by two places in fourth. Final qualifying brought Webber up a place behind Heidfeld. In the race Webber progressed well, pitting on lap 21 then again 15 laps later having completed a huge spin that wrecked his tyres and lost him places he wasn't to regain, Webber had a better last stint to finish sixth. Heidfeld had a worse race; running his engine for its second hot race it started smoking in his second stint and he retired the car out on the track. Now apparent in development on the car, McLaren are open that their car has problems. The team are confident its aerodynamic performance is adequate, as the car takes high-speed corners well, but the car is under using its tyres. This is believed to be a suspension geometry issue; the tyres aren't getting enough energy put into them, perhaps exacerbated by the lack of power from the Mercedes engine. The result is a car that takes time to get its tyres up to speed; this ruins qualifying and the poor grid positions force the team to run heavy fuel loads, putting the drivers in the more risky midfield for the opening stints. By race end the car is one of the fastest on the track, but they have already lost too much ground at this stage to get better finishes. A clean set of Friday sessions saw the race drivers complete only slightly less mileage than Alex Wurz, the third car driver. Qualifying saw stand-in driver Pedro de la Rosa go out first on a dusty track and, despite running wide over some kerbs, he was able to set a time that would remain respectable enough for ninth. Kimi Raikkonen also struggled with the car in the slower corners, running wide out of the last corner to finish seventh. In Q2 Raikkonen's lap dropped him two places, contrasting with de la Rosa's improvement to eighth. Sunday's race saw de la Rosa driving aggressively but inaccurately; in his haste to pass other cars he often left the road after out-braking himself, but overall he made progress to finish in fifth. Raikkonen's race to third place was more controlled despite a wild trip over the kerbs in his second stint and a fuel nozzle stuck momentarily in his second pit stop. Outwardly unchanged for Sakhir, Sauber had a poor weekend. Friday was spent focussing on long runs and not fast laps, as well as letting Jacques Villeneuve further familiarise himself with the car and its brakes. Villeneuve's first qualifying lap was early in the session and he struggled with understeer, going spectacularly off over kerbs at one point. Felipe Massa's later lap was better, but was compromised by a slow sector 2. On Sunday morning Massa lost two places to end up twelfth with a disappointing lap, while Villeneuve remained in sixteenth. The drivers were running heavy fuel loads and Massa stopped late for his first of two stops; Villeneuve was again struggling and was eventually hit by David Coulthard, forcing his retirement. Some reward was Massa's first points of the year with an eventual seventh place. A clean Friday session with plenty of laps in the afternoon saw the drivers happy with the car but well down the time sheets. More positive times came from the Saturday morning sessions with Christian Klien ahead of Coulthard, who was complaining of poor balance and a lack of traction. This was backed up in Qualifying 1 when Klien hooked up a good lap to split the McLarens in eighth, while Coulthard was 0.5 sec slower than Klien with a small error and shift light problems hampering his lap. The race ended immediately for Klien when his car stalled on the grid with an electronics problem. Coulthard race was equally fraught, with an incident on the opening lap and another in the last laps with Villeneuve, but he was able to claim a point at the finish for eighth place, albeit a lap down. Friday saw the race drivers completing their laps with some good pace, while Ricardo Zonta timesheet-topping form ended in the afternoon session with a gearbox problem. Both drivers were near the top of the time on Saturday qualifying, which ultimately ended in disappointment for Ralf Schumacher and delight for Jarno Trulli. Schumacher's lap was ruined by two errors on turn 1 and turn 8, pushing him back to eleventh, while Trulli's form put him in second. Second qualifying saw Schumacher run a little lighter on fuel and regain five places to qualify sixth, while Trulli kept his front row slot. In the race Trulli's first stint saw him close to Alonso, but ultimately he was outpaced and eased off for the balance of the race. Schumacher had a bigger fight on his hands and, despite running off track a few times, ended up fourth for the team's best ever result. With Friday running smoothly and both drivers enjoying the circuit the team ended up between Minardi and the rest of the pack as usual. Qualifying 1 saw Tiago Monteiro go well, being six tenths up on Minardi with Narain Karthikeyan ahead of him despite a poor middle sector on his lap. Karthikeyan's race ended abruptly with an electrical problem, while Monteiro soldiered on to finish tenth and only a lap down. Still awaiting the PS05, which has yet to emerge for testing, the team ran its PS04b with the definitive low diffuser. Friday went cleanly and the team's top speed of 323 kph was respectable considering the old engine design they are using. Qualifying laps contrasted the drivers' styles, with Patrick Friesacher chopping at the wheel throughout his lap and Christijan Albers being much smoother and faster. The race saw the drivers run to the finish albeit 3-4laps behind.